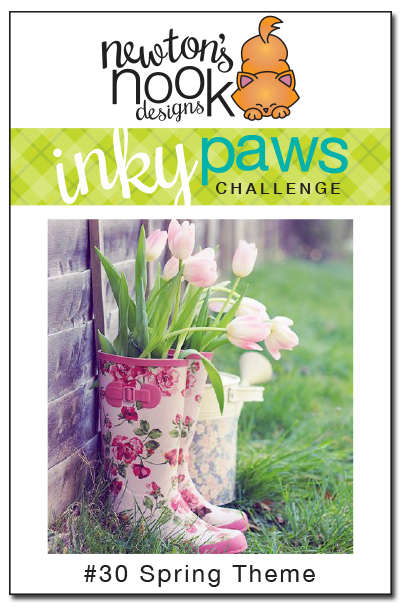 create a project with a Spring Theme! You have TWO WEEKS to play along - Deadline to enter is Friday, April 8th, 2015 at Midnight CST. The winners will be announced on the NND blog on Monday, April 11th. We usually pick our favorite entries for each challenge theme but this month we thought we'd switch things up a bit and pick TWO RANDOM WINNERS - so every entry has an equal chance to win. Just follow the guidelines below to qualify. Post your project to your blog or to an online photo gallery such as Flickr, Pinterest, or splitcoaststampers (on splitcoast please use keywords newtonsnook and IPC30). Kimberly created this beautiful spring sky using our new Beautiful Wings stamp set and Beautiful Wings Die Set! Awww! 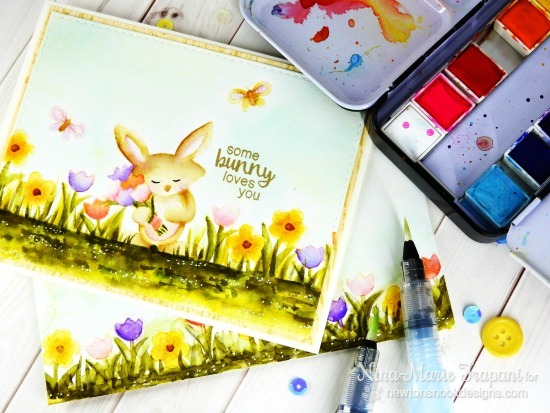 I love the fun little bunny in the frame on this card by Samantha! She used our Hello Spring stamp set. This sweet little wagon card by Yukari is perfect for spring! I love the soft colors she used! The wagon is from the Wagon of Wishes stamp set and the "hello friend" sentiment is from the Versatile Vases stamp set. Nina-Marie got out her watercolors to do some springy no-line coloring! She used our Hello Spring stamp set. You can check out her blog today for a video too! 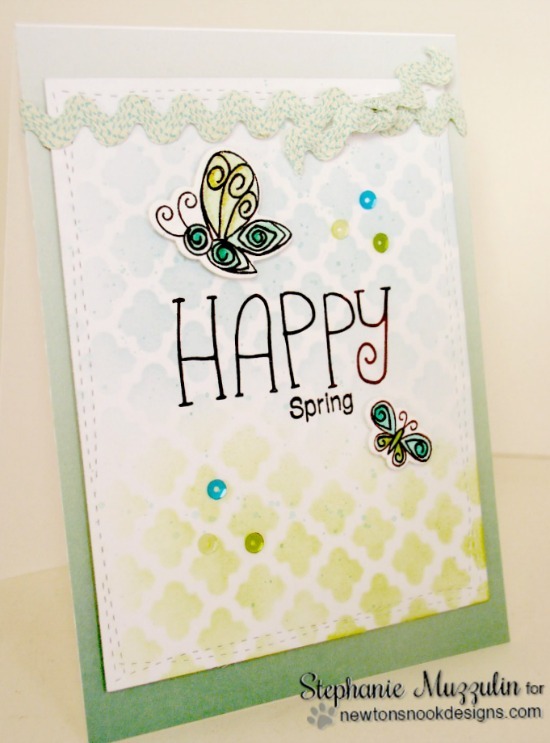 This beautiful spring card by Stephanie is so cheerful! 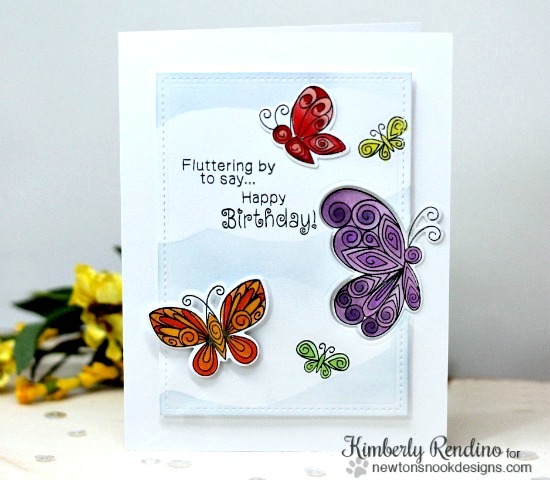 She used the new Beautiful Wings stamp set and Beautiful Wings Die Set for the butterflies and our Simply Seasonal stamp set for the sentiment. 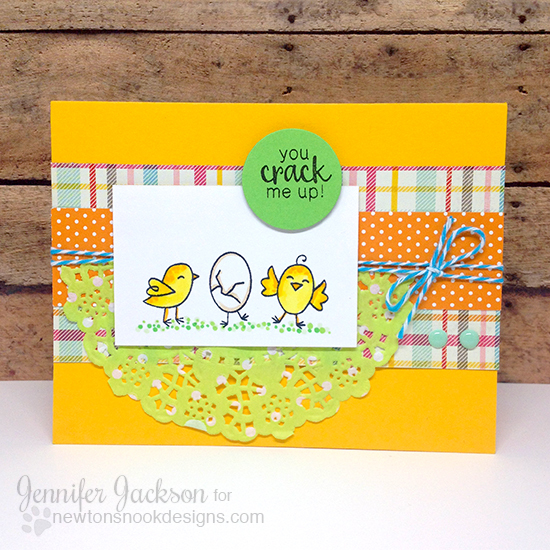 And here's one by me - I created a fun little card using the chicks and cracked egg from the new Hello Spring stamp set, mixed with some fun bright pattern papers.